Didi Hirsch Mental Health Services honored music icon Judy Collins, “Touched with Fire” writer/director Paul Dalio, and actress/filmmaker Anna Akana, at its annual Erasing the Stigma Leadership Awards on Thursday, April 27, 2017 at the Beverly Hilton Hotel. Melissa Rivers was the evening’s emcee. The event celebrated the nonprofit agency’s 75th anniversary of service and raised more than $620,000 for its activities as a leading provider of community mental health and substance use services in Los Angeles County. Didi Hirsch is also home to the nation’s first Suicide Prevention Center, a national leader in providing training, research and services to people contemplating suicide, concerned loved ones and those who have attempted or are grieving a loss. Singer/Songwriter/Author/Activist Judy Collins, whose son, Clark, died by suicide in 1992 and who herself struggled with substance use and mental illness, received the 2017 Beatrice Stern Media Award for her passionate efforts to raise awareness about suicide and mental illness. In an interview with reporter Michael Harrison of “Up Close and Far Out” before the event, she said: “I have written extensively about the secrets of my family, fundamentally, the alcoholism, and I’ve written about my life as a survivor, what I’ve done to get through it and get over it, and I like to share that with people. That’s why this award is an honor.” Collins’ performance, which included “Both Sides Now” and “Amazing Grace,” closed the event with a standing ovation. “General Hospital” veteran actor Maurice Benard, a 2002 honoree, presented the Leadership Award to Writer/Director/Composer Paul Dalio, who said, “I do believe that stigma is the root of most problems associated with bipolar disorder. So to me, it’s the biggest honor to have such an impactful organization give an award to the thing that I consider to be the biggest problem with bipolar.” Dalio’s film debut, “Touched With Fire,” was inspired by his own experience and explores the relationship between mental illness and creativity in a story of two young poets who fall in love while hospitalized with bipolar disorder. Other celebrated supporters of the organization who attended the event include Elizabeth Frances of the AMC series “The Son,” Jake Allyn of BET/VH1’s “The Quad,” Liam Dow, of the upcoming summer film “The Three Stooges,” and music artist, Larissa Lam. For 75 years, Didi Hirsch Mental Health Services has been a leading provider of free community mental health and substance use services. 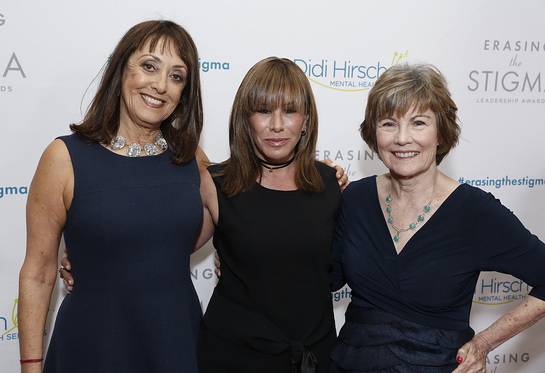 Dedicated to serving communities where stigma or poverty limits access, Didi Hirsch helps 100,000 children and adults each year. It has therapists at 11 locations and 100 schools throughout Los Angeles and Orange counties and is home to the Suicide Prevention Center, the nation’s first and a national leader in training, research and services. We help people contemplating suicide, concerned loved ones and those who have attempted or are grieving a loss. Our multilingual crisis line answered nearly 87,000 calls/chats/texts nationwide in 2016 and is one of three that takes calls for the national Disaster Distress Helpline.